September is here, and we’re shifting the It Can Wait® movement into high gear! During this month, we want you to show your commitment to this cause by sharing our new impactful video, “Close to Home.” There’s power in numbers! Sharing this video “Close to Home” on social with your family, friends, and social network. Your influence can help keep those closest to you safe. #Tag5toSave5 friends by encouraging them to share this life-saving message. Renewing your pledge. Go to ItCanWait.com to extend your commitment beyond not texting while driving. 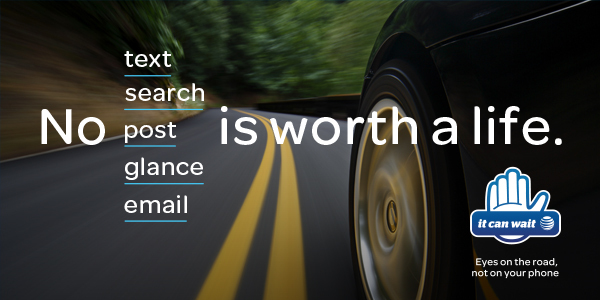 No text, search, post, glance, or email is worth a life. Thank you for your loyal commitment to helping us take the distraction out of driving. Please use this email to communicate the importance of safe driving and remind your network that no emailis that important. It Can Wait. This entry was posted in Technology and tagged campaign, commitment, Drive, It Can Wait, numbers, Partner, people, Pledge, research, survived, technology, Text, Video, WIPP by WIPP. Bookmark the permalink.